India is a land of diversity. The country has varied culture, religions and festivals. In spite of the diversity, the country is one and united. All the festivals are celebrated with much enthusiasm and excitement. The festivals are celebration for the birth of legends in different religions and their victory over the evil. It is also known as Ram Navami. This festival is celebrated by the Hindus for the birth of Lord Ram. He was the son of King Dashratha and Kaushalya of Ayodhya. Lord Ram is believed to be the seventh incarnation of Lord Vishnu. Half of his powers are from Lord Vishnu. This festival falls on the ninth day of the Shukla Paksha in the Chaitra month as per the Hindu calendar. This is usually during the month of March and April. 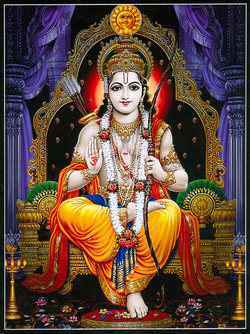 Rama Navami is for nine days which can be understood from the word Navami itself. As it is celebrated for nine days it is also called Rama Navaratra. Rama Navami is one of the oldest festivals celebrated in the country. Its origin is centuries old. Ramayana is an important religious epic for the Hindus. The epic tells us about the life of Ayodhya’s King Dashratha and his son Rama. The King had three wives but neither of them could give him a child. Due to this he was worried about the throne. He performed a yagna which a great rishi told him to do. After he finished the yagna, Yagneshwara gave him a bowl of heavenly kheer. He has to give the kheer to his three wives. They were pregnant after a few days. On the ninth day of the month of Chaitra, they gave birth. Kaushalya gave birth to Rama, Kaikeyi to Bharata and the third wife Sumitra had two sons. Their name was Laxman and Shatrughana. The birth of four sons in Ayodhya was a joyous celebration for the people. Rama was sent to the earth by Lord Vishnu to save his people and maintain Dharma. He is called the seventh incarnation of Lord Vishnu. Later on, Rama destroyed Ravana. Ravana was a demon and was the king on Lanka. He did many other good and surprising deeds which showed his holiness to the people. When Rama became the king, the people of Ayodhya celebrated his birthday as a very important day. Moreover, they had faith him and he was sent by Lord Vishnu to save the humanity. People who worship Lord Rama clean their house before Rama Navami. They keep the idol and pictures of Lord Rama in the worship place of the house. They fast on this day. It is believed that if people fast on this day and worship Lord Rama with devotion they will get salvation. The idol of Lord Rama is beautifully decorated with flowers, sweets and fruits. The idol of Rama is accompanied by that of Sita and Hanuman. People arrange for bhajans both at house and temples. They sing these bhajans which are about Lord Rama. In some of the places, people even read the Ramayana. Pandals are constructed in many places where the idol of Lord Rama is placed and worshipped by the people. The people are put a tika on their forehead and aarti is done. After the puja everyone gets prasad. People even organize fairs or melas to celebrate this festival. They even arrange cultural program where they perform skits of Lord Rama’s life and many other events. Devotees also go to pilgrimages and rath yatras during this time as this time is considered as the holy time for the Hindus. People say that chanting Rama’s name helps them to achieve peace, wisdom, joy, understanding etc. For some of the states in the country, this is celebrated for ten days. People spend these days with full devotion to Lord Rama. They fast and pray to him. They wear new clothes and make special sweets. Rama Navami is celebrated all over the country, but in Ayodhya it is celebrated with such energy, enthusiasm and excitement that it cannot be compared to the other states. The devotees take a dip in the holy river as it is believed that doing that all their sins will be washed away. The important thing we should learn or rather remember from Ram Navami is that no matter how evil tries to destroy us, the good will finally destroy the final. Rama Navami reminds us about the victory of Lord Rama over the demon Ravana. Rama Navami also reminds about the epic Ramayana. The epic constantly reminds us to maintain Dharma. Lord Rama and the demon Ravana had opposite characteristics. Lord Rama had love, humility, care etc while Ravana had ego, greed, jealousy. Ravana always caused problems for the people and Lord Rama saved them. Ravana’s cruelty and actions led to his own destruction in the end. We should learn from Lord Rama’s teachings. He teaches how we should be as a son, as a husband, as a father, as a brother etc. For example: He teaches that as a husband he should always protect his wife and fight for her whenever she is in trouble. Devoting oneself to God does not mean praying to him and offering sweets, flowers only on the day of festival. It should be done every day with utmost devotion, dedication, love, purity. We should try to bring the qualities of God in ourselves. This will happen when we know the teachings of God, preach them and practice in reality. All human sin but that does not mean God is not with us and will not guide us. We must ask forgiveness from God for whatever wrong is done. Asking for forgiveness will not make us a small person but we will become a better person. All the religions teach us that good will always win over the evil. There will be light after every period of darkness and we should be attached to the worldly pleasures and materialistic things. We should focus more on our inner self.